A man holds a photograph of his daughter and son-in-law who were killed when a shell struck their garage in Oleksandrivka on January 16, 2015. (Berlin) – Separatist rebel forces were probably responsible for two recent unlawful attacks with unguided rockets in eastern Ukraine, which together killed at least 41 civilians, including two children, and wounded more than 100 civilians, Human Rights Watch said today. During a recent on-the-ground investigation, Human Rights Watch also found that both Ukrainian government forces and the Russia-backed rebel forces have unnecessarily endangered civilians by locating military objectives and using explosive weapons with wide-area effect in populated areas, including near school buildings, in violation of international humanitarian law. Around January 10, 2015, after a relatively calm two-month period, fighting in eastern Ukraine significantly intensified and spread to several parts of the front as Ukrainian government forces and rebels fought for control of the Donetsk airport. The intensified fighting has resulted in a significant increase in casualties. A medical official collecting information from both rebel and government-controlled areas said that at least 341 people, including 71 women and 6 children, had died in the Donetsk region in January. Human Rights Watch research has found that a significant number of the January casualties were civilians, including children as young as 2. Many of the recent civilian deaths were due to violations of the laws of war, in particular the unlawful use of unguided rockets in populated areas, Human Rights Watch found. On January 24, unguided rockets, probably launched from rebel-controlled territory, killed 29 civilians and 1 soldier in Mariupol and wounded more than 90 civilians. One rocket struck the courtyard of a school. On January 13, unguided rockets, also probably launched from rebel-controlled territory, killed 12 civilians and wounded 18 at a checkpoint near Volnovakha. Circumstances point to Ukrainian government forces’ responsibility for an unguided rocket attack in Donetsk on January 16 that killed two civilians. In spite of investigating the attack site, Human Rights Watch was not able to attribute responsibility for a third major incident resulting in civilian casualties, an attack in Donetsk on January 22, which killed 13 civilians, according to local authorities. There are numerous reports of additional civilian deaths in both government- and rebel-controlled territory, particularly in the period since January 13, that Human Rights Watch has not investigated. Both sides to the conflict should stop using unguided rockets and explosive weapons with wide-area effect in populated areas, Human Rights Watch said. Both sides should also scrupulously respect their obligations to avoid endangering civilians by not locating military objectives in populated areas and by taking all feasible measures to protect the civilian population. In the period of the attacks documented here, Ukrainian authorities and other governments claimed that there was a significant increase of Russian troops in eastern Ukraine. Human Rights Watch is not in a position to determine whether Russian troops played a role in any particular attack, but called on Russia to investigate whether weapons, volunteers, or soldiers from Russia have been involved in unlawful attacks. Since the beginning of the conflict there has been a failure to enforce justice for serious violations of international human rights and humanitarian law, and civilians continue to be at risk of repeated violations. On January 26, President Petro Poroshenko said that the Ukrainian authorities will submit information about the Mariupol attack and other incidents to the International Criminal Court (ICC). Ukraine should remove the time constraints in its April 2014 declaration accepting the ICC’s jurisdiction, Human Rights Watch said, and join the court’s treaty, the Rome Statute. That would open up the possibility of subjecting a wider range of incidents to ICC scrutiny. Shortly after 9 a.m. on January 24, salvos of unguided rockets struck a residential area around the Kiev market in the eastern part of Mariupol, a city under government control. As of January 25, the attack had killed 29 civilians and 1 military serviceman and wounded more than 90 civilians, according to Ukrainian authorities. Authorities said that the death toll might rise as several of the wounded were in critical condition. Human Rights Watch visited the impact area about six hours after the attack. In a 1.2 kilometer-long section along Kyivska Street, Human Rights Watch examined 31 rocket impacts on the ground and on buildings. There were dead bodies lying by the market. I saw one dead body, then another. A third dead body belonged to a girl who used to work in the used clothes store. Her head had been crushed. A rocket fell right on the market, destroying it. Luckily, there were no students in the school when the rocket fell here. Otherwise, we would have had dozens of dead children here. First there was a rumbling sound and then there were a series of explosions. It started maybe near the Kiev market, maybe beyond. And then the explosions came closer and closer. But it went very fast. I didn’t even have time to run 10 meters to seek shelter. The rocket attack injured Sergey, who was being treated for a fragment injury to his leg in a hospital in Mariupol when he spoke with Human Rights Watch. His daughter also had light injuries. Based on the damage, craters, and rocket remnants, Human Rights Watch concluded that the area had been hit by salvos of Grad rockets. The area that was hit was the easternmost residential area in government-controlled areas. Information Human Rights Watch gathered at the scene indicates that the rockets were fired from separatist-controlled territory to the east. The impacted buildings had all been hit on the exterior wall facing due east, or in the case of one building, on the wall facing northeast. All the craters in the ground Human Rights Watch examined indicated that the rockets had come from the east, and in three cases the tail of rocket remnants stuck in the ground pointed east. The Organization for Security and Co-operation in Europe (OSCE) reported that some rockets also struck from the northeast. Some impacts on buildings examined by Human Rights Watch could have come from either the east or northeast. Human Rights Watch did not examine reported impacts along Olimpiiska, a parallel street, due to the risk of renewed shelling. The northernmost impact site Human Rights Watch examined was about 600 meters south of a main road where government forces were manning a checkpoint, local residents said. Local residents told Human Rights Watch that they heard two additional salvos in the area in the early afternoon, to the north of the first strike. OSCE monitors on the ground reported that the two afternoon salvos struck close to the government checkpoint on the main road. That these strikes hit closer to the government checkpoint suggests that the checkpoint might have been the target of the first strike as well. Between 2:00 and 3:00 p.m. on January 13, an attack on a checkpoint near Volnovakha, about 50 kilometers southwest of Donetsk, killed 12 civilians and wounded 18 who were waiting in a bus near the checkpoint. Human Rights Watch visited the site on January 21 and examined nine craters, both north and south of the checkpoint, including one about 10 meters from where the bus was waiting in line at the time of the attack. The craters and weapon remnants at the site indicated that the area had been struck by Grad rockets. Both the target and the incoming direction of the attack indicate that the attack was launched from rebel-held territory. The attacked checkpoint is the northern-most government checkpoint before the front line with rebel forces. The tube-like shape of the craters clearly indicated that the rockets had come from the northeast. A video recorded by a surveillance camera at the checkpoint shows dozens of explosions to the north of the checkpoint over a short period of time. Ukrainian authorities said that they had identified 88 impact sites. As with the Mariupol attack, pro-rebel social media accounts claimed in the immediate aftermath of the attack that rebel forces had conducted a successful attack on the checkpoint. Later, however, the claims were deleted and modified, in some instances to blame Ukrainian government forces for the attack. Some observers speculated that the bus was hit by fragments from a landmine planted near the checkpoint by government forces. In one version of this theory, the nearby impact of the Grad rocket detonated the landmine, whose fragments struck the bus. Supporters of this theory cite the presence of landmine warning signs along the road where the bus was attacked, a video that possibly shows a soldier carrying a landmine in the aftermath, and allegations that the damage to the bus was not consistent with a Grad attack. While Human Rights Watch has not had direct access to the bus to examine the damage, videos and photos indicate damage to the bus that appears consistent with an attack by a Grad rocket with a high-explosive/fragmentation warhead. The side of the bus facing the impact site contains dozens of holes of varying size. 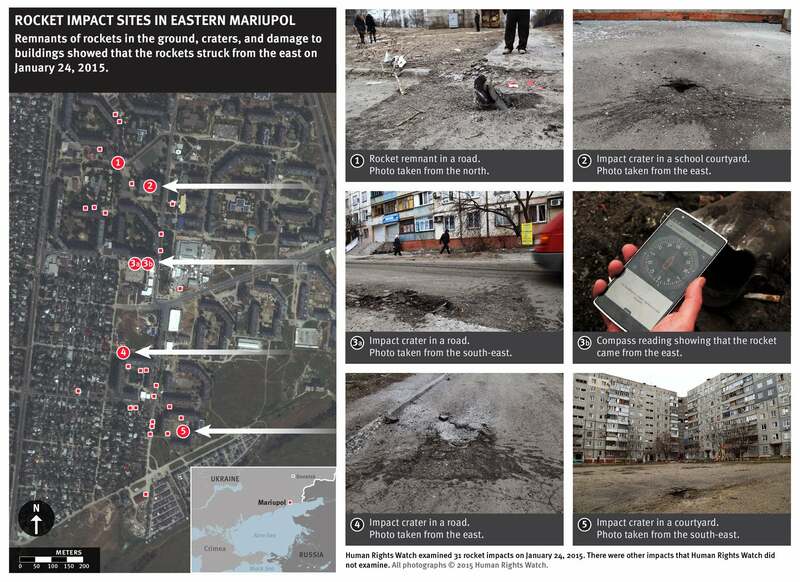 Human Rights Watch observed similar damage to vehicles from other Grad rocket attacks, for example in Mariupol. The checkpoint near Volnovakha is the main government checkpoint on the road between Donetsk and Mariupol, the two main cities in the region. Civilian cars are usually lined up at the checkpoint, waiting to pass. The surveillance camera footage and a video recorded by a dashboard camera at the time of the attack show civilian cars passing through the checkpoint and several cars waiting in line. There appears to be no particular military movement in the area at the time of the attack. Regardless of whether a landmine exploded, there is little doubt that the checkpoint was the probable target of a Grad attack from rebel-held territory. Targeting a checkpoint with salvos of Grad rockets in the middle of the day, when numerous civilian cars and civilians are there, is an indiscriminate attack that violates the laws of war. At about 11:00 p.m. on January 16, Grad rockets struck a residential area in the Tsyganskyi settlement of the Kirov district in Donetsk, killing two women. Human Rights Watch visited the area the following day. The whole family was at home. My mother-in-law was taking a bath, getting ready to go to sleep. Then the first shell fell in the garden and then there was a second explosion when a rocket hit the bathroom. All the windows shattered. A second woman was killed when a rocket hit her house at Gogol Street 5, neighbors said. The neighbors said they had not realized that the house had been hit until the next morning. They found the owner dead on the floor. Local residents said that they had discovered about 10 impact sites in the area. Human Rights Watch examined seven. Craters, damage to buildings, and the remnants of one rocket indicated that the attack had come from the southwest. In that direction, the front line between government and rebel forces was about 10 to 12 kilometers away. The location of the impact site in a rebel-controlled area, the direction of the attack, and the location of government forces within range all point to government forces being more likely to have been responsible for the attack than rebels. In addition to unlawful attacks using unguided rockets in populated areas, Human Rights Watch documented that government and rebel forces unlawfully endangered civilians by locating military objectives in populated areas and failing to take feasible precautions to prevent harm to civilians. Human Rights Watch is also concerned about the frequent use of explosive weapons with wide-area effect in populated areas. Frequent strikes on residential or civilian buildings, and corresponding civilian casualties, indicate that neither side is capable of targeting these weapons accurately enough to ensure that using them in populated areas is not indiscriminate. On January 22, several shells fell near an intersection in southern Donetsk, killing 13 civilians, according to local rebel authorities. When Human Rights Watch arrived to investigate the incident on January 24, local authorities had already filled in two craters in the street, making it difficult to draw firm conclusions. Photos from the immediate aftermath of the scene and information provided by journalists, however, indicated that the attack had come from the northwest. Human Rights Watch identified a rebel military base about 500 meters from the incident, which probably constituted a target for government forces. Human Rights Watch documented that several Grad rocket attacks struck residential areas around this base in August 2014, and government forces appear to have attacked this base in the past. The photos and remnants of the craters suggest, however, that the area might have been attacked by mortar shells with a maximum range of about seven kilometers from the northwest, placing the probable launch site in rebel-controlled area. Because the attack might have originated from within rebel-controlled area, Human Rights Watch was unable to draw any conclusions as to who was responsible for the attack. Between 8:00 and 9:00 a.m. on January 18, at least 12 shells struck a residential area near an abandoned mine in the Kirov district in Donetsk, killing three civilians. The shells fell like on a chessboard. The first shell fell in my house. Then another one in the house a couple of houses away. And like that to the intersection. I ran toward the house, calling for an ambulance on the way. I ran into the courtyard, where there was complete chaos. My son is now in the morgue. I dug him out from a layer of dust. He had suffocated. My oldest son [age 7] was buried under boards from the roof. I dug him out and took him to the basement. The doctors saved him, but he lost his nose. They extracted shrapnel from his head and from his leg. He is now lying there, in pain. My wife’s leg had to be amputated. It was like a nightmare. Who will be held accountable for this? Bobrichev’s mother, who was in the backyard at the time of the attack, was also seriously injured. Human Rights Watch examined the area on January 19. One of the shells had hit the northwestern wall of a building, indicating that the shell had struck from that direction. All other impacts were consistent with this finding. Remnants of shells and the size of some of the craters indicate that the area was struck by shells from large-caliber tube artillery, causing significant blast and fragmentation damage. The front line was about 12 kilometers northwest of the building, with the nearest government forces in Pisky, a village northwest of Donetsk. The maximum range of the artillery weapon probably used in the attack is 25 to 30 kilometers, depending on the exact type used. Adjacent to some of the houses that were struck, Human Rights Watch identified a commercial building that appeared to be used by rebel forces, the likely target of the attack. Human Rights Watch observed about a dozen armed men in camouflage uniforms around and in the courtyard of the building and three military trucks around the building. The armed men did not permit Human Rights Watch to examine whether the building and its courtyard had been hit. Local residents confirmed that rebel forces were using the building and said that they had heard outgoing fire from nearby on the day before the attack. The presence of a rebel military base in the vicinity, the direction of the attack, and the location of government forces within firing range indicate that government forces were responsible for the attack. On January 13 and 20, several explosive weapons struck Hranitne, a small village 60 kilometers south of Donetsk that normally has about 3,500 inhabitants. When we drove into the courtyard, a neighbor came out carrying Dasha, in blood all over. One of her eyes was missing. The other eye was all in blood, as was her stomach. We put her down on the couch and called the ambulance. The ambulance arrived and we wrapped her in blankets. I was calling to her: “Dashinka, Dashinka,” but she couldn’t say anything. She was just looking at me with one eye. By the time the ambulance got to settlement 18 she had died. Hranitne is in government-controlled territory, but very close to the front line with rebels. Local residents told Human Rights Watch that government forces are located in several places around the village and that they sometimes fire from the village at rebel positions on the other side of the river, which effectively constitutes the front line. The woman said that local residents had gathered around two or three months ago, asking the soldiers to leave because the residents were afraid that the soldiers’ presence would draw fire. The soldiers refused, the woman said, saying that they did not have orders to leave their bases. Soldiers manning a checkpoint outside the village refused Human Rights Watch entry on January 23, saying that only locals were allowed. Human Rights Watch also documented the following six attacks in rebel-controlled territory that illustrate the toll that explosive weapons with wide-area effects are taking on civilians. In each case, the resulting civilian loss indicates that the attacking forces are not capable of targeting these weapons accurately enough in populated areas to prevent an indiscriminate attack. These attacks also demonstrate that the harm to civilians is foreseeable when firing concentrations of mortar, tube artillery, and rockets into populated areas. On January 18, at least five shells struck a residential area in central Donetsk. Human Rights Watch has documented numerous previous attacks in the area. Damage to buildings indicated that the shells came from the west or northwest. Human Rights Watch is not aware of any serious injuries resulting from the attack.